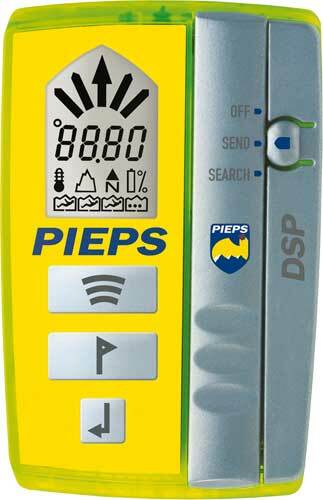 The Pieps DSP (original) was discontinued in 11/2013. It was replaced by the Pieps DSP Pro. Summary: The Pieps DSP (not to be confused with the DSP Tour, DSP Sport, or DSP Pro) is a small beacon, it has one of the longest ranges of the digitals, it allows you to lock-out a transceiver during a multiple burial, its third antenna is excellent at dealing with spikes during deeper burials, it handles frequency drift well, and it can be periodically upgraded with newer features. The Pieps Tour is a nearly-identical twin to the DSP, but the Tour has only one button, three fewer features, and a lower price tag. The Pieps DSP Advanced included the same features as the Pieps DSP plus it added a temperature display, compass, and barometric altimeter. Searching: The DSP has a long range and an intuitive direction indicator. As with the other DSPs, the reception range is excellent even when the antennas are out of alignment. The direction indicator refreshes slightly slower than the Trackers (although I haven't quantified this or adequately compared it to the Pulse). As with most transceivers (the main exceptions being the Ortovox S1, Mammut Pulse, and the Mammut Element), if you are headed in the wrong direction (which can easily happen, since transceivers simply align you with the transmitting beacon's flux lines) you will need to notice that the distance is increasing and turn around. Multiple Burials: The handling of multiple burials is similar to other digital transceivers: you press the Mark button to "suppress" (aka, "mark") the current beacon and advance to the next beacon. (The DSP and Tour require you to press and hold the button.) The DSP also has a Scan function that will display the number of transmitters within 5, 20, and 50 meters. Read about these multiple burial features here. Spikes: The Pieps DSP was the first three-antenna beacon and set the standard for spike handling. Controls: The switch that changes between Off, Send, and Search is one of the most intuitive of the 40 beacons reviewed. A bump of the switch changes from Search back to Send (although the DSP Sport and DSP Pro improved on the switch by making it glove-friendly). The Mark button (a flag, which is reasonably intuitive) tells the transceiver to ignore the nearest transceiver during a multiple burial search. Due to the magnetic switch in the original (yellow) DSP and DSP Tour, it is possible for a large radio or for magnetic jacket closures to turn off the Pieps (details here). Comfort: The Pieps harness is now on its third generation. The original black and subsequent silver harnesses were far from ideal. The new harness is a very comfortable pouch-style harness. The DSP Sport/Pro harness is even better (and will work with the older DSPs). Other Features: The DSP lets you check the transmitting frequency of your friend's transceiver. It has a "Smart Transmitter" which modifies the cadence of the transmitted single to reduce the likelihood of signal overlap during a two-victim multiple burial. The scan function shows the distance to multiple victims. Version 5.0 and newer versions of the software supports the Pieps iProbe. Version 8.2 and newer versions of the software supports the Pieps TX600 Dog Transmitter. The Pieps DSP is programmed to blink the little man icon ( ) at the bottom of the screen when it senses a continuous background signal (i.e., an older analog beacon). To test this, I searched for an Ortovox M1 which had a strong background signal. The DSP's man icon did not blink during the coarse search, but it did display two blinking men during the fine search. I treat the blinking men as a indication that the DSP is aware of an unusual signal and is trying to interpret it. Upgrades: The DSP can be upgraded via the earphone jack. Read about the latest software updates here. Other: Read about the DSP's self-test. The Pieps warranty only covers the DSP for 2 years unless you register it within three months of the date of purchase, in which case the warranty is extended to 5 years. Pros: Long reception range, marking.